The school uniform colours are navy and gold. It is hoped that parents will make every effort to ensure their children are dressed appropriately. This can be worn all year round, but should be worn from October half term to Easter. For ease of dressing Reception children only can wear a summer gold polo shirt. 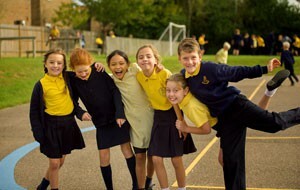 All children will also need a PE kit of navy shorts, t-shirt & plimsolls/trainers. Please make sure that all items of clothing are clearly marked with your child’s name. No responsibility is accepted by the school for the loss of, or damage to, personal property. Book bags, PE bags each and painting aprons can also be purchased. Children should wear black shoes or plain black trainers. Shoes should be chosen for safety not fashion and be comfortable and sensible with a heel no more than 1 inch. Open toed sandals and sling backs should not be worn. No jewellery should be worn to school except for watches and earrings. Earrings should only be studs or sleepers and must be removed for all PE activities. Teachers are not permitted to remove or replace any earrings and therefore, it is strongly recommended that young children do not wear them to school. Please do not allow your child to attend school wearing nail varnish, make-up and/or body art. 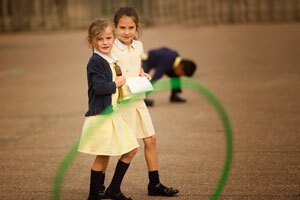 Uniform can be purchase from Schoolwear Plus, one of the largest independent schoolwear specialists in Essex. Their store is located at 12 Parkway, Chelmsford, CM2 0NF and their in-store staff are fully-qualified and trained to handle all aspects of school uniform matters. They offers an online shopping facility at www.schoolwearplus.com through which you can purchase specific school uniform items and general schoolwear and accessories. You can choose to collect your order from the store or have the items delivered to your home for a small additional charge. They are happy to exchange or refund items returned within 28 days of the purchase date provided that the items are in the same condition as when purchased, i.e. unworn, unwashed, unironed, with packaging and labels intact. (Please note that returns are not permitted for sale or reduced-price items). During the summer holidays, to encourage you to purchase your uniform early and to cater for any unexpected growth spurts, they will accept returns up to the end of the break.